DemoCurmudgeon: Vos bypasses Medicaid Expansion/Jobs/New State Revenues to protect Insurer Profits!!! Vos bypasses Medicaid Expansion/Jobs/New State Revenues to protect Insurer Profits!!! Fulfilling campaign promises is so important to Republicans that they would shut the government down to keep one. Yet when Democratic Gov. Tony Evers tried to do the same thing, promising to expand Medicaid, he's accused of trying to "score political points?" And that's what snarky Republican Rep. Robin Vos said about Evers proposal. Medicaid Expansion No Brainer: WPT's Here and Now presented a few important points, including the not so surprising admission by public servant Vos that he's out to protect insurance profits, and not provide health care to constituents. First, here's what Gov. Evers sees as a win-win for Wisconsinites and the economy with Medicaid Expansion. The math is inescapable, and another revealing horror from Scott Walker's "legacy:"
Yes, Vos and Sen. Scott Fitzgerald walked away from $1 billion because government would just spend, spend, spend...on roads, schools, broadband expansion, pay of debt, etc.??!!! In fact, Evers is so sure about Medicaid Expansion, that he's taking it directly to Republican rural voters who have been ignored by Walker and the legislature for years, under the guise of "small government." The days of rural resentment might be over. Tony Evers: If Republican legislators who come from small town Wisconsin that understand that the success of those small town hospitals and clinics depend upon having access to greater resources, they may change their mind. So we’re going to take this directly to the people of Wisconsin in a respectful way. Uh-oh, Wrong Argument Robin...: For Vos, it's not about helping and strengthening rural communities and farmers, nope, it's about protecting those city slicker insurers. Vos claims insurers will be forced to pay into Medicaid Expansion, and then increase insurance rates on those buying policies in the private sector, something I can't confirm after extensive research (but I did find job creation and higher state revenues-shown later below). 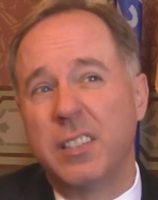 Robin Vos: Every person that’s on BadgerCare is subsidized by somebody who’s in the private insurance market. So the more people that we take from the private insurance market to put into the public market, the higher the rates are going to go for those people who have private sector insurance. So granted, there might be a short one-time savings for the state, but that is more than offset by the cost in the private sector for what they have to pay to subsidize those people who are already on BadgerCare. The Montana report comes as Missouri, Nebraska, Idaho and Utah are working to put Medicaid expansion on this November’s general election ballot and as legislatures in other states like Virginia and Utah are moving Medicaid expansion bills forward. Last year, the University of Michigan said “ripple effects” from Medicaid expansion created more than 30,000 new jobs, including 85% in the private sector.